There are human experiences that must be seen and felt to be appreciated. Witnessing a sunrise is such an experience. May we share with you our poetic interpretation of this event? May we attempt to leave with you our impressions of this miracle of Nature? 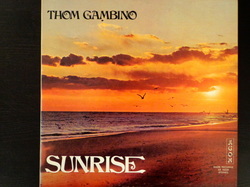 SUNRISE was written by Thom Gambino during a recent tour with the Lionel Hampton Orchestra. At the conclusion of a nightly engagement in Miami Beach, Thom spent most of the night on the beach in meditation. The awe and spectacle of the morning sunrise left such an impression on him that, upon returning to New York, he wrote this album. SUNRISE is the entire first side of this album. Six other pieces comprise the flip side. The album should be listened to as a total experience…just turn off the lights, pour a drink, lay back, put on earphones if you have them…and enjoy a unique poetic theater piece…on a RECORDING!!! While "Sunrise" is long and reflective, "Homemade Wine" and the other Side B compositions project a totally different mood, highly agitated and disconcerting in places. All of the pieces on this album showed my state of mind when I left Lionel Hampton, strived to reestablish a stronger relationship with Lorry and my children and embarked on new musical directions on my own. PUBLISHED BY SUN﻿RI﻿SE ARTISTRIES, INC. I first met Vin Gagliano at Sound Center Studios in NYC in February, 1972, just as I was contemplating leaving Lionel Hampton’s group. Hamp was going to campaign for Nixon’s reelection primary bid–and I couldn’t, wouldn’t. Vin was a bit older than me, and he had vast experience in recording and producing. He took me under his wing, but our relationship grew in other ways, too. I was an emotional wreck. I was not only transitioning from being a road musician who played nearly every night to being a stay at home musician and arranger with no money or gigs–and poetry was spewing out of me–a very new and bewildering experience. Vin understood all of this, found me a steady gig with a Korean band at the old Hawaii Kai tourist restaurant on Broadway. He gave me great advise and emotional and financial support. He helped me set up my publishing company. Vin Gagliano was in need of an arranger who could write charts for his singer clients. One of them needed a backup band. Prometheus fit that bill and I successfully finished arranging, contracting and performing on that album. I also wrote about five demos for Charlie Brown and Yvonne, Vin’s singing duet clients. I wrote the arrangements, performed and conducted the orchestra (strings, horns, rhythm). In return, I recorded and Vin produced my “Sunrise” album, all free of charge. Vincent Gagliano stayed in touch with me through the years. He was my friend until his death in 2008. "Jimi Hendrix used this recording/mixing console in the late 1960s at Sound Center Studios in New York City. The sessions were the first in which Hendrix produced himself. None of the recordings were released during Hendrix’s lifetime, but two songs from these sessions have been issued posthumously. “My Friend” appeared on First Rays of the New Rising Sun, and “Somewhere” was included in The Jimi Hendrix Experience box set. "The console with producer’s station was custom designed and built by Lenny Stea and Gordon Clark for Sound Center Studios as one of the first eight-track consoles in New York City. In addition to Hendrix, Aretha Franklin, the Four Seasons, Barry Manilow, the Tokens, the Manhattans, Dion and the Belmonts, Jeff Beck, Noel Redding (solo) and many others made recordings with this equipment. The Sound Center engineers who used this console include Gordon Clark, Vincent J. Gagliano, Tom Muccio, Angel Sandoval and Lenny Stea." Lorry and I arrived early at the United Nations on the 20th anniversary of Earth Day, April 22, 1990, the beginning of the U.N.’s “Decade of the Environment.” We took our seats in the balcony of the General Assembly Hall. As the program started, we spotted Marty and Melinda Dunayer walking to their front row center seats near the front of the podium on the stage. They were decked out in matching white tuxedos with tails. They took their seats and, as did the rest of us, they waited to see the finished version of their project for the first time. The program featured a gathering of 41 astronauts and cosmonauts and the "Only One Earth" video, respendent with Marty's music. And so began the inspiration for the Dunayers' "Let It Be Earth Day Every Day" project. Marty called the representatives of nearly all of the child performers in movies and on television at the time. He acquired a team of fundraisers and the backing of Rincon Children's Entertainment and BMG Records. All of the proceeds from the project were to aid the environmental group Earthtrust. After months of preparations (described in great detail in "The Vagabonds: A Musician's Odyssey"), we assembled an all-star rhythm section and filmed and recorded the main theme's parts at Power Station in NYC. We flew to Los Angeles with the film crew, technicians, director, met all of the arriving children and their parents at LAX, and, on February 1st and 2nd, 1992, we gathered at Evergreen Studios in Burbank and filmed and recorded 100 child stars (including a few young adults) as they sang Marty and Melinda's "Let It Be Earth Day Every Day." Eric Balfour (“Kids, Inc.”), Christopher Bell (Films), John Aaron Bennett (“I’ll Fly Away”), Dustin Berkovitz (“Sisters”), Lindsay Berkovitz (Films), Megan Berwick (“Salute Your Shorts”), Jason Biggs (“Drexell’s Class”), Kenny Blank (“The Super,” co-starring with Joe Pesce), Zachary Bostrom (“Harry and the Hendersons”), Zachery Ty Bryan (“Home Improvement”), Clara Bryant (“Billy,” starring Andy Rooney), Laura Bundy (“Ruthless”), Chris Burke (“Life Goes On”), Olivia Burnette (“The Torkelsons”), Justin Burnette (“Dynasty”), Eugene Byrd (“Beverly Hills, 90210”), Josh Byrne (“Step By Step”), Monica Calhoun (“Bagdad Cafe” Monica appeared in the television show and the movie), Brandon Call (“Step By Step”), Candace Cameron (“Full House”), Domenica Cameron-Scorsese (“Cape Fear”), Gabrielle Carmouche (“Big Brother Jake”), Christopher Castile (“Step By Step”), Kevin Chevalia (“Folks”), Anna Chlumsky (“My Girl,” “My Girl II”), Chance Michael Corbitt (“The Lost Boys”), Christian Cousins (“Kindergarten Cop”), Joseph Cousins (“Kindergarten Cop”), Quinn Culkin (“Wish Kid”), Dylan Day (“The Babe”), Venus DeMilo (“Salute Your Shorts”), Deanna DuClos (“Earth Day” Demo), Danielle DuClos (“Aspects of Love”), Rachel Duncan (“The Torkelsons”), Luke Edwards (“Davis Rules”), Tim Eyster (“Salute Your Shorts”), David Faustino (“Married – With Children”), Michael Fishman (“Roseanne”), Ryan Francis (“Sisters”), Sara Gilbert (“Roseanne”), Brian Austin Green (“Beverly Hills, 90210”), Seth Green (Films), Sylver Gregory (“Royal Family”), Richard Habersham (“The Long Walk Home”), Adam Hann-Byrd (“Little Man Tate”), Melissa Joan Hart (“Clarissa Explains It All”), Jennifer Love Hewitt (“Kids, Inc.,” lead in ABC-TV’s “The Audrey Hepburn Story” in March of 2000), Daniel Hilfer (“Big Brother Jake”), Miko Hughes (“Kindergarten Cop”), Adam Jeffries (“True Colors”), Ashley Johnson (“Growing Pains”), Haylie Johnson (“Kids, Inc.”), Rae’Ven Kelly (“I’ll Fly Away”), Geoff and Savannah King (Rincon Kids), Christine Lakin (“Step By Step”), A.J. Langer (“Drexell’s Class”), Joey Lawrence (“Blossom”), Matt Lawrence (Films), Ashlee Levitch (“I’ll Fly Away”), Emily Ann Lloyd (“Kindergarten Cop”), Eric Lloyd (“Wonder Years”), Jeremy London (“I’ll Fly Away”), Dana Lubotsky (“Straight Talk,” “The Babe”), Heidi Lucas (“Salute Your Shorts”), Kellie Martin (“Life Goes On”), Darius McCrary (“Family Matters”), Crystal McKellar (“Wonder Years”), Danica McKellar (“Wonder Years”), Aaron Metchik (“The Torkelsons”), Kevin Mockrin (Films), Elissabeth Moss (Lifetime Film: “MIdnight’s Child”), Brittany Murphy (“Drexell’s Class”), Corin Nemec (“Parker Lewis Can’t Lose”), Lee Norris (“The Torkelsons”), Courtney Peldon (“Harry and the Hendersons”), Ashley Peldon (“Deceived”), Danny Pintauro (“Who’s The Boss?”), Carol-Ann Plante’ (“Harry and the Hendersons”), Markus Redmond (“Doogie Howser, MD”), Giovonni Ribisi (“Davis Rules”), Eden Riegel (“Will Rogers Follies”), Sam Riegel (“Guiding Light”), Naya Rivera (“Royal Family”), R.D. Robb (“Les Miserables”), Crystal Robbins (“The Long Walk Home”), Natanya Ross (“Billy”), Justin Shenkarow (“Eerie, Indiana”), Anna Slotky (“The Torkelsons”), Taran Noah Smith (“Home Improvement”), Ben Taylor (Recordings), Jonathan Taylor Thomas (“Home Improvement”), Josiah Trager (“Big Brother Jake”), Casper Van Dien (“Dangerous Women,” later in “Starship Troopers”), Jenna von Oy (“Blossom”), Angela Watson (“Step By Step”), Nathan Watt (“Davis Rules”), Jason Weaver (“The Long Walk Home”), Scott Weinger (“Full House”), Jeremy Wieand (“Big Brother Jake”), Kelly Williams (“Family Matters”) and Jimmy Workman (“The Addams Family,” “Addams Family Values”). Along with the video, we all helped the Dunayers produce an original music CD featuring some of the stars, a television program and a series of PSAs with the children describing their personal efforts to promote awareness of global warming and how they apply those lessons in their own lives. 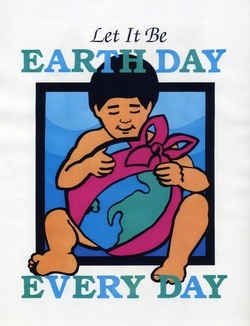 The project was completed but never released, due to a nearly total lack of corporate interest in Earth Day projects in general during that time, and an argument between Rincon and BMG in particular. We were all heartbroken. See the main theme video on Yo﻿uTu﻿be. See the Promo video on YouTube. See the UN's "Only One Earth" video on YouTube. See our photo slideshow here. 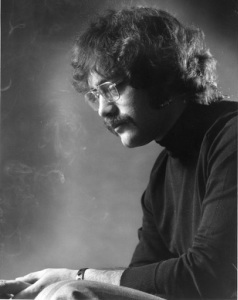 My mentor Thom Gambino, whose years of friendship and love have been my beacon, and without whose musical talent and faith this album would not have been possible. Jeff Ganz and George Naha for their friendship and virtuosity. Their talent and support helped make this album a joyful labor of love. Steve Boyer for his encouragement and dedication to this album and, most of all, for my being able to call him my friend. Tony Bongiovi for his firm belief in me and the privilege of working at Power Station. Hear the music on ﻿SoundCloud﻿. My favorite orchestration is "Lullabye" and my favorite personal solo is on "I Heard the Angels Sing," which Marty recorded first on acoustic piano. I then provided an improvised overdub solo throughout the composition in one take. I had finally recovered some of my chops, so badly damaged by rounds of oral surgery. Recording this song was truly an emotional experience for me. After we completed "Songs of the Muses" in 1995, I performed on and helped arrange a CD for Symbiose, a Paris-based group from Zaire (Dem. Rep. of the Congo). They called me "Sherlock," because they'd often summon me to Power Station Studios in the middle of the night to listen to a tune and write out horn parts for the players, whom I'd join on alto sax for the occasion. The Symbiose CD was released that year. Next, I recorded with daughter Kim as she sang pianist Arturo Vacio's compositions in flawless Spanish. I recorded and arranged a number of projects during that time, but then Power Station closed and my oral problems returned, throwning me back to ground zero, never to play again. Maybe. We'll see.